Click on any access points along the map for more information. Parola’s Bend site 1: The road to this site is accessible in a 2WD vehicle in any weather conditions. Access and parking at this site should only be attempted in a 2WD vehicle in the dry. The banks are steep but have good access to the water, and camping is permitted. There is good tree cover and a lot of space. It also has many tracks, which may lead you to different fishing locations. The turn off to the site is 37.6km north of Wangaratta along the Murray Valley Highway. The access point (or parking) is a further 400 from the turn off. The target species are Murray cod and yellowbelly. 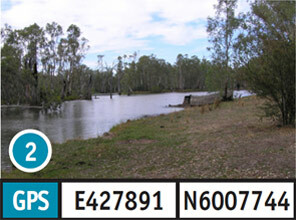 Parola’s Bend site 2: The road to this site is accessible in a 2WD vehicle in any weather conditions. Access and parking at this site should only be attempted in a 2WD vehicle in the dry. 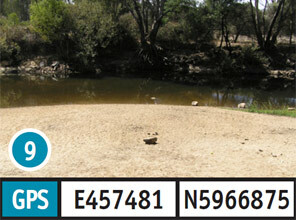 This access point has a dirt boat ramp that is in poor condition and should only be used by 4WD in the dry. As with the other site, it has steep banks but good access to the water. Camping is permitted and there are also picnic tables. The turn off to the site is 37.6km north of Wangaratta along the Murray Valley Highway. The access point (or parking) is a further 400 from the turn off. The target species are Murray cod and yellowbelly. 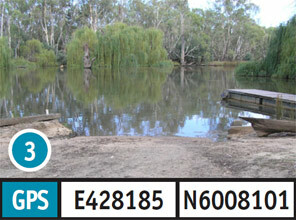 Bundalong Caravan Park: The road to this site is accessible in a 2WD vehicle in any weather conditions. 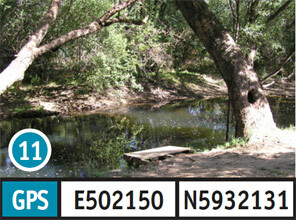 Access and parking at this site should only be attempted in a 2WD vehicle in dry weather. There is a concrete boat ramp that should only be used in a 2WD vehicle in the dry. The bank slope is steep and the access to the water is moderate. The parking area is small. There is plenty of tree cover and a small jetty. The turn off to the site is 38.6km north of Wangaratta along the Murray Valley Highway. The access point (or parking) is a further 500 from the turn off. The target species are Murray cod and yellowbelly. Peechelba Road: The road to this site is accessible in a 2WD vehicle in any weather conditions. Access and parking at this site should only be attempted in a 2WD vehicle in dry weather. The bank slope is very steep and the access to the water is poor with not a very large area available to fish from. Camping is permitted at this site. There may be some better spots along the many kilometres of tracks in this area. The turn off to the site is 24km north of Wangaratta along the Wangaratta/Yarrawonga Road. The access point (or parking) is a further 2.4km from the turn off. The target species are Murray cod and yellowbelly. Frosts Track: This track is part of a network of many tracks and it could be quite easy to get lost. The road to this site is accessible in a 2WD vehicle in any weather condition, however access and parking at this site should only be attempted in a 2WD vehicle in the dry. The bank slope is between steep and moderate and the access to the water is moderate. Camping at this site is permitted and there is a large amount of tree cover available. The turn off to the site is 16.9km north of Wangaratta along the Wangaratta/Yarrawonga Road. The access point (or parking) is a further 2.5km from the turn off. The target species are Murray cod and yellowbelly. Northern Beaches (Wangaratta): The road to, and parking at this site, is good and can be accessed in a 2WD vehicle in any weather. The bank slope is moderate and the bank access to the water is moderate. There are picnic tables available. The turn off to the site is 600 north of Wangaratta along the Wangaratta/Yarrawonga Road. The access point (or parking) is a further 1.2km from the turn off. The target species is trout. Sydney Beach Wangaratta: This site is located in the city of Wangaratta. The road to, and parking at this site is very good and can be completed in a 2WD vehicle in any weather. The bank slope is flat to moderate and the bank access to the water is good. There are picnic tables and bins here. It has good tree cover and a large parking area. 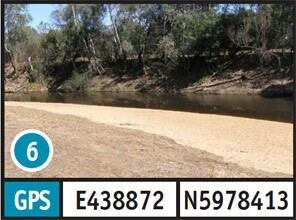 This site is located in Wangaratta, and is 400m west of the Great Alpine Road turnoff, towards Wangaratta town centre. The target species is trout. 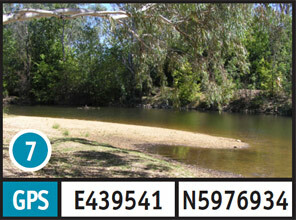 River Road Reserve (Tarrawingee): The road to this site is accessible in a 2WD vehicle in any weather conditions. Access and parking at this site should only be attempted in a 2WD vehicle in dry weather. The bank slope is flat to moderate and the bank access to the water is good. Camping is permitted, and there are picnic tables and a large parking area. The turn off to the site is 12.9km east of Wangaratta along the Great Alpine Highway. The access point (or parking) is a further 2.4km south along River Road. The target species is trout. Markwood Everton Road Bridge: The road to, and parking at this site is good and can easily be accessed in a 2WD vehicle. The bank slope is steep and access to the water is moderate. There are toilets, picnic tables and camping is permitted. A sandy beach is exposed when river levels are low. The turn off to the site is 21.6km from Wangaratta along the Great Alpine Highway. The access point (or parking) is a further 1km south along the Markwood/Everton Road. The target species is trout. 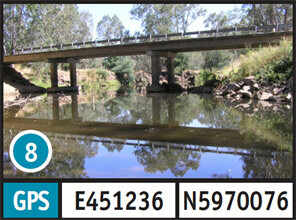 Nimmo Bridge (Myrtleford): The road to this site is accessible in a 2WD vehicle in any weather conditions. 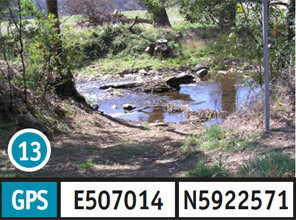 Access and parking at this site should only be attempted in a 2WD vehicle in dry conditions. The bank slope is moderate and bank access to the water is good to moderate. This site has a large parking area. There is another access point on the other side of the bridge. 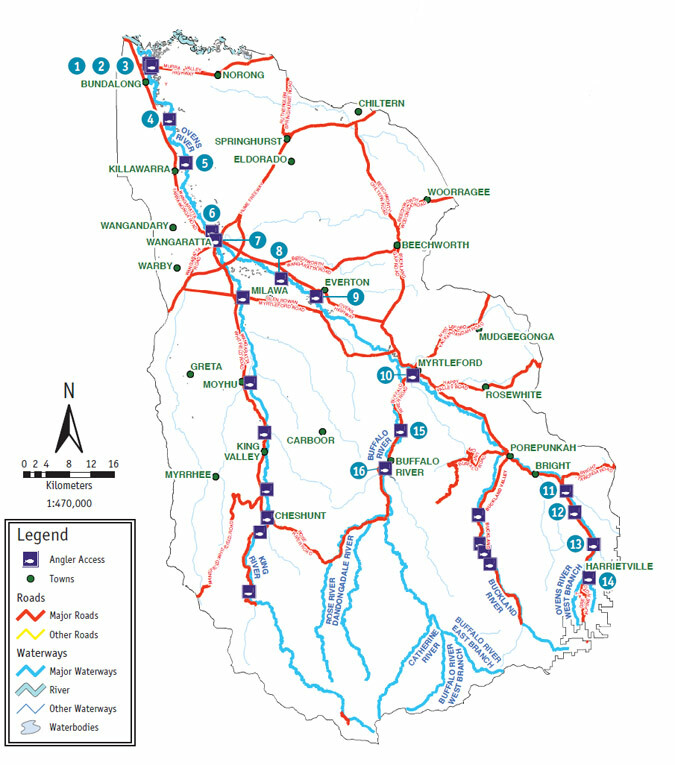 The turn off to the site is 48.6km south-east of Wangaratta along the Great Alpine Highway. The access point (or parking) is a further 1.4km south along the Buffalo Road. The target species is trout. Snowy Creek Picnic Area: The road to, and parking at this site can be is accessible in a 2WD vehicle in any weather conditions. There is ample parking, picnic tables and fireplaces. There are all three bank slopes represented (flat, moderate and steep), and the bank access to the water is good to moderate. There is shade and a large hole good for both fishing and swimming. The turn off to the site is 87.4km south-east of Wangaratta along the Great Alpine Highway. The access point (or parking) is a further 300m east, along the Old Harrietville Road near Germantown. The target species is trout. 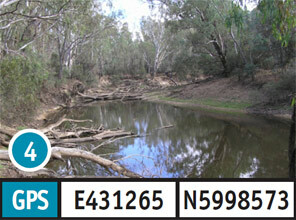 CFA Draughting point: The road to this site is accessible in a 2WD vehicle in any weather conditions. Access and parking at this site should only be attempted in a 2WD vehicle in the dry. There is a large parking area with good tree cover. There is limited access to the water but the available access is good. The bank slope is flat and the bank access to the water is good but limited. 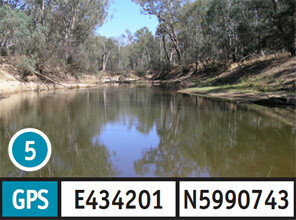 This site is located 91.5km south-east of Wangaratta along the Great Alpine Highway. The target species is trout. 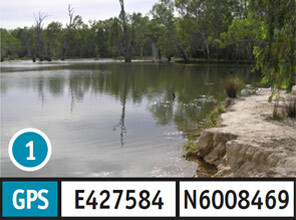 Smoko: The road to, and parking at this site is good and can be accessed in a 2WD vehicle. There are picnic tables and a fireplace available. The bank slope is steep and the bank access is hard and poor. There is some good fish habitat at this site. 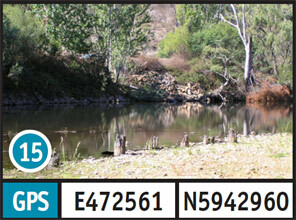 This site is located 98.4km from Wangaratta along the Great Alpine Highway. The target species is trout. 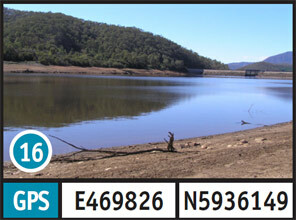 Tronah Lake (Harrietville Dredge Hole): The road to, and parking at this site has easy access and can be accessed in a 2WD vehicle in any weather conditions. Tronah Lake is well set up for all the family. It has a very well-maintained picnic area with tables and BBQ, built shade areas, tree cover, public toilets and there is also a jetty. It is a stocked water body so there are fish at this site. The bank access to the water is moderate with a steep bank slope. The turn off to this site is located 104.2km south-east of Wangaratta along the Great Alpine Highway, and then 900m east along the Bon Accord Tk or Dredge Hole Lane. The target species is trout. Nug Nug Wayside Stop: The roads to, and parking at this site is good and is easily accessed in a 2WD vehicle. The bank slope is flat to moderate and the bank access to the water is hard. Facilities at this site include picnic tables, fireplaces and a large parking area. The turn off is located 48.6km south-east Wangaratta along the Great Alpine Highway. 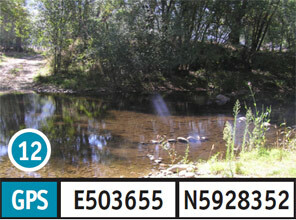 The access point (or parking) is a further 13.8km south of Myrtleford, along the Buffalo River Road. The target species is trout. Lake Buffalo: The roads to, and parking at this site can easily be completed in 2WD vehicle. There is a boat ramp that should only be attempted in a 2WD vehicle in the dry. The bank slope is both flat and moderate and the bank access to water is good. 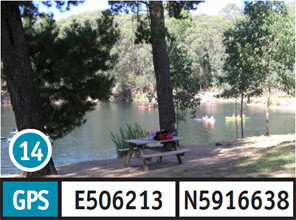 Facilities include toilets, picnic tables, a BBQ and swings set in a large well maintained area. The turn off is located 48.6km south-east of Wangaratta along the Great Alpine Highway. 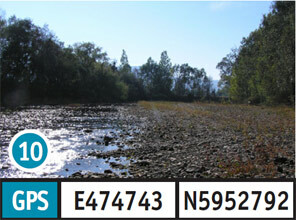 The access point (or parking) is a further 21.8km south of Myrtleford, along the Buffalo GPS E469826 N5936149 River Road. The target species is trout.